If you've checked out the pages on Vitamin C Benefits, Deficiency and How Much Vitamin C, you'll be interested in what foods and supplements are the best way to get your C.
Knowing which foods are chockablock is not all that you need to know to ensure you get the C you need. Transport, storage and cooking techniques can all diminish the Vitamin C in foods, if you're not wary. 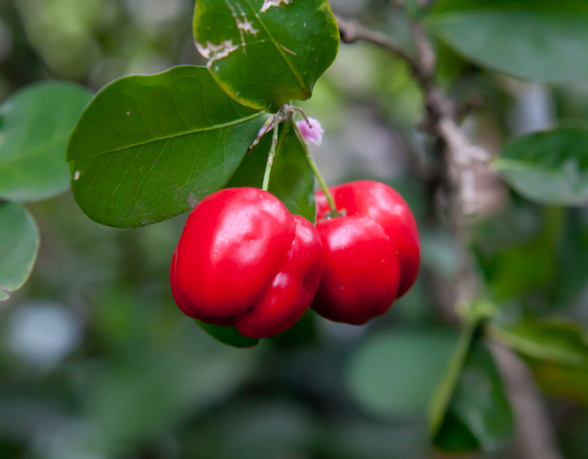 The Queen of Vitamin C foods is the acerola cherry AKA the Barbados Cherry. It is a common base for Vitamin C supplements. Not surprisingly. the most abundant dietary sources of Vitamin C are fresh fruits and vegetables with peppers, citrus fruits and berries along with green leafies like broccoli and kale topping the list. While unpasteurized dairy products and meat from grass fed animals, can be a source of Vitamin C, most commercial milk and its products are pasteurized, a heating process, which destroys all Vitamin C.
Cooking meat effectively destroys the Vitamin C contained in it. GETTING THE BENEFITS OF VITAMIN C – TOP FOOD SOURCES. To find more Vitamin C Sources from Food check out the USDA National Nutrient Database. Vitamin C Sources - Preserving the Vitamin C in the food you eat. Because it is water soluble, Vitamin C is easily destroyed. If not careful, you may get less Vitamin C from the food you eat than you think. .... Remember that heat and air destroy Vitamin C.
For this reason, unduly long transport and storage times can diminish Vitamin C levels. Local vegetables and fruits picked recently will likely have higher Vitamin C levels than those shipped across country or continents. That orange sitting your fridge or on your counter for 3 weeks may, indeed, have zero Vitamin C by the time you peel it. Fresh raw foods are best. Fresh vegetables and fruits should be kept sealed in the refrigerator away from light, air and heat until eaten. Vitamin C rich foods when cut or squeezed should be consumed immediately. Many commercially prepared juices contain little Vitamin C especially after opening. The fresher the fruits and vegetables the better, so avoid fruit and veg that have hung out in the storage depot, your fridge or cupboard for weeks or months (blah!). Any form of cooking or heat diminishes a food’s Vitamin C content. For example, raw spinach has more Vitamin C than cooked spinach. This is another reason why you should eat at least some raw fruits and vegetables every day. While raw is best for Vitamin C content, lightly steamed or microwaved vegetables are better than boiled. Flash frozen fruits and vegetables are superior to canned vegetables and fruit when it comes to Vitamin C content. Canned veg generally have very low Vitamin C content because of the high heat in the canning process. They also may contain unhealthy levels of tin or other contaminants. Vitamin C Sources - Thinking of Supplementing Vitamin C? After reading the section on How Much Vitamin C, you may opt to supplement Vitamin C in tablet form, given your age, health and/or the physical or emotional stress you are under. If this is the case, there are some things to keep in mind when picking Vitamin C tablets. Ascorbic Acid is Vitamin C’s chemical name. There is generally no difference between the naturally occurring kind and that produced artificially. Common sources for ascorbic acid supplements are arecola cherries and corn. Because many Vitamin C tablets are made from a corn base, corn-sensitive people should be cautious when choosing their supplement to avoid allergic reactions. Some people find ascorbic acid overly acidic. Ascorbate forms of Vitamin c such as calcium or magnesium ascorbate, are buffered or non–acidic forms that may be better tolerated and have a more alkaline effect on the body’s PH than the ascorbic type. The most common side effect is diarrhea. This disappears when intake is decreased. One drawback to ascorbate forms of Vitamin C supplements is that, because they are alkalizing, they may neutralize stomach acid. Stomach acid is important for digestion and often decreases with age, affecting digestion. Anything that decreases the body’s ability to absorb nutrients should be taken cautiously, especially as we get older or if we are at risk for malabsorption conditions. If you suffer from excess stomach acid, as some do, you might choose the ascorbate version of Vitamin C.
Vitamin C Sources - When it comes to Supplemental Vitamin C, what is Bowel Tolerance or Laxative Level? In the world of Vitamin C mega-dosing, the level at which an individual gets diarrhea or loose stool when taking Vitamin C supplements is called "bowel tolerance" or the "laxative level". Just under this level is where proponents of Vitamin C mega-dosing suggest you aim, in order to maximize Vitamin C tissue saturation. When your need for Vitamin C increases, such as in the case of illness, stress, age or intense exercise, your bowel tolerance level may increase. For example, when in good health you may only be able to take 5 grams of Vitamin C per day before symptoms appear; when seriously ill with an active viral infection like hepatitis you might be able to consume many times that level before suffering digestive effects. This suggests your body’s increased need for Vitamin C.
When taking oral Vitamin C supplements, remember these tips so you get the most out of your supplement. Take smaller doses at regular intervals throughout the day to achieve your daily total. Some say a healthy adult cannot absorb more than 500 mg Vitamin C at a time, without the rest being excreted. Modest doses of Vitamin C at regular intervals throughout the day, will ensure greater and more sustained tissue saturation, which is the aim of the game when it comes to getting the benefits of Vitamin C.
Drink sufficient water to reduce the theoretical risks of kidney stones. Don’t let ascorbic acid remain on teeth as it could damage enamel. Rinse mouth with water after taking. If seeking the greatest tissue saturation possible with Vitamin C in the case of serious illness , seek a health care provider who has experience supplying IV or intramuscular sodium ascorbate. Research shows that, with this method of Vitamin C supplementation, a person can achieve much greater tissue saturation than with oral supplements alone. This may be important, if you want the explore the full therapeutic benefits of Vitamin C. Follow the advice of your medical practitioner. Vitamin C Sources - To read more about topics related to Vitamin C, press on the below. Press here to read more about the Benefits of Vitamin C.
Press here to read more about Vitamin C deficiency conditions. Press here to read more about how much Vitamin C you need.